Combination insulator and attachment for receiving an insulated gate handle. 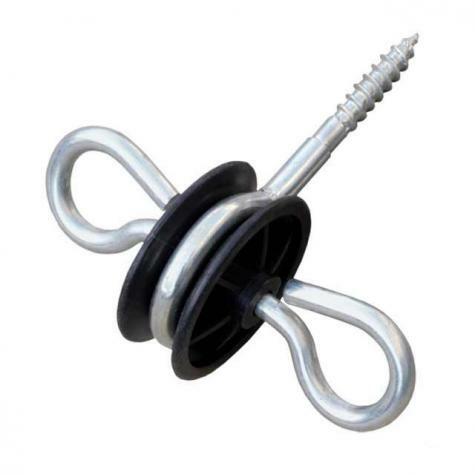 Screws into wood posts. Used as an insulator for making gates "hot". Metal loop on both sides allows gates to be hooked onto either side. 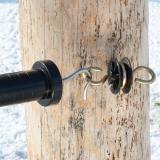 Screw activator into wood post either by hand or by inserting a screwdriver into the rings. Screw insulator completely into post. To connect the electrical flow to the activator and gate, attach a piece of insulated wire from fence to one of the loops on activator. (Shed off approximately 2" of insulation and wrap the bare wire around loop.) A SafeHandle will hook into either loop. When the handle is connected, the gate is energized. When the handle is not connected, the gate is not energized. Also see downloadable electrified gate diagram above. These are much bigger and sturdier than some I got from another online store. With both sheep and cattle, I use wire panel gates for keeping dogs in and predators out. But cattle are inclined to push them down, especially one bull. So I use them to put a hot twine just over the top of the panel and no more problems. 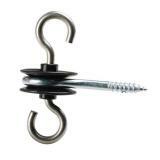 I use these at corners where fences come together. By attaching each fence to the rings I can get electricity to all my wires. I once bought the "same" product at the feed store, but the plastic was so cheap it didn't insulate and the wrong parts of the fence were hot. Now I only buy Premier. For the first time in over 10 years use I just had a horse get caught up when being chased and was surprised to find the ring came apart as the other review noted. But, better that than not have anything give and have the horse wrapped up in the fencing. We've been using these for about a year now. They work ok but the middle piece bends if a horse gets caught up in it and both eye hooks fly off.